Revelation Software will be presenting at the International Spectrum 2017 Conference and Exhibition which will be held between the 1st May 1st and 4th May 2017 at Litchfield Park, AZ. You’re probably familiar with OpenInsight from Revelation Software, the MV development tool and database that was written for the Windows world. What you haven’t seen is OpenInsight 10 – completely rewritten from the base code up, it has a new, industry standard IDE for desktop Apps, a new web-based design platform for browser-based design, and as always our connectors to all the MV databases, cloud-based databases, and SQL. Today saw the Revelation Software 2015 Conference begin in earnest and what a day it would prove to be. With motivation, inspiration and education flowing throughout the day, this is looking like being the best Revelation Conferences for years. Mix in the massive changes to OpenInsight and this is one conference that I personally think that no professional OpenInsight developer should have risked missing. The day began at 08.00am for breakfast with everyone congregating in the room that would serve to be our refreshment room for the day. Whilst the welcome reception the night before was busy, the breakfast was even busier. Anyway, onto the more important matters of the day and I should qualify this posting with a quick statement that I really cannot do the first day justice. There was just too much going on from the off and I’d be here half the night typing and still only scratch the surface. Following breakfast, we all joined together in the main conference room for Mike’s opening Welcome Address. Mike spoke on three key topics being the State of the Company and where we are now, Current Development and our Future Direction. During the first section, Mike outlined where we are and how things are going. He also introduced new members of staff that have joined since the last conference, where we are marketing and he reminded everyone that our licensing prices remain stable and largely unchanged. The Current Development was all about OpenInsight 10 and that would form the backbone of this conference. Turning to the future direction, he discussed the Internet of Things, the continued rise in Mobile Computing and that we will be pushing harder on performance gains and cloud solutions. Mike then handed over to Dan Lier for one of the most enlightening and motivational talks that I have heard of in a long time. It is very easy to feel down about things at the moment and there are far too many people looking to the negativity in the economy, their market places and life in general. Revelation has weathered the recessions well and the community has much to be positive about. Dan’s talk was a perfectly timed reminder that we all need to believe in our products and our abilities, that we need to maintain a positive attitude and to be consistent in our daily lives. Dan is making his give-away available to all attendees via a free download and I have permission to offer that to my blog readers. It is getting late and I have another long day ahead of me, so that’ll be the topic of a separate blog posting. Owing to the importance of the OpenInsight 10 knowledge to be shared at this specific conference, the key presentations are being repeated this year. This makes deciding which to attend much easier and, following lunch, I decided to listen to Carl talk about the Forms Designer and Presentation Server enhancements that are coming in OI10. The are numerous and far reaching and I really can’t begin to list them, or even highlight them, here. However, to summarise, the general message was that a number of functions have been deprecated in favour of cleaner better ways of doing things – whilst making sure that existing application will not break. He then also worked through the numerous APIs and controls that have been enhanced and how the panels work within the new product. In short, Carl’s presentation was all about how OI10 will help developers to be more efficient, work smarter and provide end users with a faster and slicker looking interface. Best of all, for those of us developing solutions with OpenInsight, we will not have a huge learning curve because Revelation are putting the OPEN back into OpenInsight and making things super easy for us to use during our OI9.x and prior application upgrades to 10. For me, I’ll have a toolset that is more intuitive, more recognisable and that will help our customer base and new developers to build better systems, faster and smarter that before. Carl was up against Bob Carten who was talking about Indexing and Selection Changes in OI10 and I hope to catch that presentation during it’s rerun tomorrow. Lunch was a lovely buffet affair after which Carl continued his two part presentation. Yes, there really is that much that is changing in the presentation server and you really needed to be at the conference to get the full benefit of what is coming to all OpenInsight developers fairly soon. We run regular RUGs in the the UK but I just know that we will not be able to touch on the value wrapped up in this conference. I have said it before and I’ll no doubt say it again, but these Revelation conferences really are a must attend for all professional OpenInsight developers. In the other room David was outlining the OI120 Management Console. Following a short break, we were into the final sessions of the day. Bob Carten’s talk was all about OpenInsight and the Cloud, but with numerous EMEA clients asking about GIT support, I decided to learn a little more from Bob Catalano’s session. Assisted by Kevin Conner who spoke about the setting up of the GIT Server, Bob took the audience through Revelation’s adopted workflow for their use of GIT to help to manage the OI10 project and their development team which is spread over two continents. With a highly educational day completed, we all had an hour or so to ourselves (although some of us had clients needs to attend to) before heading down into the Black Swan bar for some amazing food and something to drink. The usual vendor fair was dropped this year in favour of a more informal session where developers were encouraged to bring along their laptops and share their OpenInsight solutions with everyone. This was a great idea and within minutes of the session opening all of the power stations had been filled and small groups were found huddled around computer screens, sharing techniques and sharing ideas with each other. The evening to busy, noisy and extremely well received by all of the delegates and Revelation staff alike. So, wow. what a first day. If this was anything to go by, I am sure looking forward to tomorrow and Friday morning and finding out more about what our wonderful toolset has to offer in the forthcoming OpenInsight 10 release. Today is the Revelation User Group for the EMEA region. We have a full room, which was bigger than originally booked, with developers and users from the UK and around Europe. 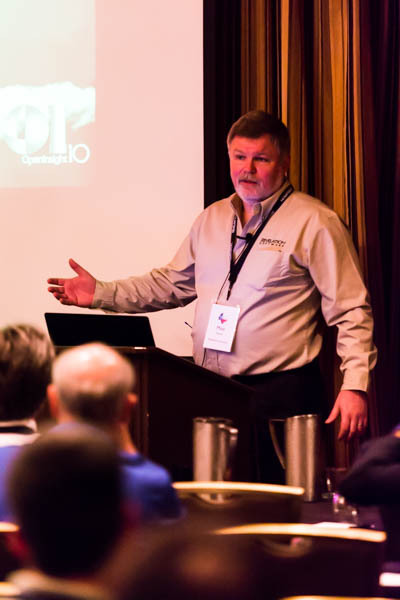 Mike Ruane has set the scene for the day and outlined the huge number of changes coming in OpenInsight 10. Mike is now into the tools and looking at what we have now for the OI 10 release. Usually, the room warms up immediately before the lunch break, but we are already receiving some great feedback from the floor. People here are already seeing the benefit of putting their needs direct to Mike and he is scribbling notes on a pad that is filling pages fast. Later we’ll be hearing from Carl about the OI 10 presentation layer enhancements, or should I say sweeping changes, and the other guys from Sprezzatura. Andrew is going to cover connectivity and Aaron will be talking about a project that he is working on and which involves moving a client back from SQL to OI. Personally I would like to thank Peter from Ardbrook for name dropping during the O4W slide. Unfortunately, the nugget of information has to stay in the room, but I saw some huge smiles around the room because it’ll help anyone selling and marketing an online application. Things are getting busy, so I’ll leave this as the one and only posting from the RUG. 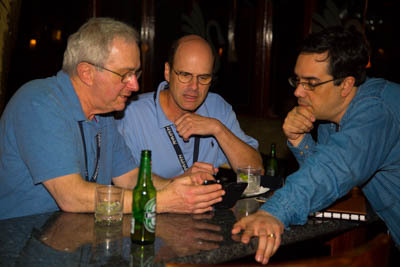 You have to be here to really experience the positivity around OpenInsight 10. I guess that begs one question – if you are an OI developer or user in the EMEA region, why are you not here with us in London? Watch the blog for some photographs from the RUG later in the week when I get back from my road trip with Mike. 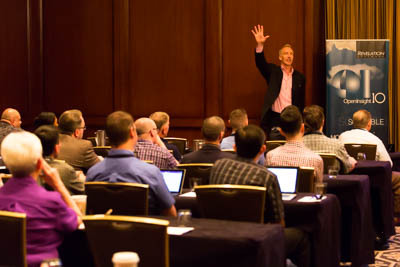 #RevCon13 – The conference draws to a close. 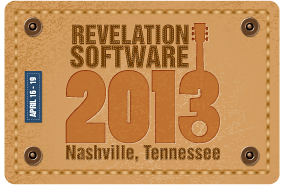 Well, all good things must come to an end and the same can be said for the Revelation Software 2013 World Conference. The final technical session is done and Mike has taken the spotlight for one last time to wrapup the conference. This will also be my final ‘planned’ blog posting with regards to this years conference. Once again, the team at Revelation have put on an amazing show and with the help of some highly knowledgable speakers everyone will have struggled to leave Nashville without a long list of things that they want to know more about, that they want to incorporate into their solutions and those all importnant little tips and how to’s that make attending the conference all too important. I hope that these blog postings have been of interest to those of you that could not make the conference this year and that they have tempted you to make the next conference. I apologise to those of you that subscribe to my blog and who have not been interested and therefore bombarded with these postings this week. You’ll be pleased to know that normal service will now resume with more occasional postings. This posting will be edited following Mike’s closing address with a few additional details, so please check back here early next week. I’ll add a new blog posting touching on the content of Mike’s closing address.